New geological investigation on Shetland has found evidence that tsunami events have occurred more frequently than previously thought. The Storegga Slide, a series of submarine landslips off the Norwegian coast 8200 years ago, caused a tsunami some 20m in height when it reached Shetland. Now BGS and Dundee University researchers, with funding from the Natural Environment Research Council, have uncovered evidence of two further tsunami events at approximately 5000 years ago and just 1500 years ago. Dr Sue Dawson of Dundee University has been using a High Definition Micro Computed Tomography scanner to build a 3D picture of core samples which point to the tsunamis being 13m above existing sea level. 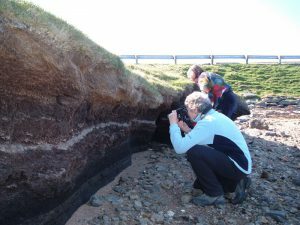 The detail will help Professor Dave Tappin of BGS in determining the source of the deposited material – were these large catastrophic events far away from Shetland or smaller events closer to home? The research is part of the Landslide-Tsunami project, ongoing research that forms a key element of NERC’s Arctic Research programme.